Description - The sleek-bodied mink has a lustrous, chocolate brown to black fur with white spotting on the chin and throat. The mink's tail is long and bushy. Average weight is 1-4 pounds, the size of a small housecat, the male being heavier than the female. 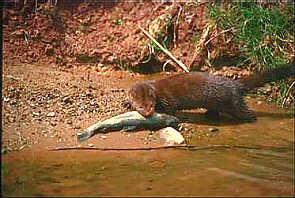 Distribution - The mink occurs throughout all of Canada along rivers, creeks, ponds, lakes and marshes. Biology - They prey chiefly on muskrats then mice, rabbits, chipmunks, fish, snakes, frogs and birds and are known to raid poultry houses. Foxes, bobcats and great horned owls are known predators. Mink den near water in abandoned burrows and move often. In the spring 3-6 young are born blind and naked. The pelts are highly valued; most of those used commercially are raised on ranches.